Of course, the best place to start is the official documentation for Dynamics 365 Portal from Microsoft. While there are still some gaps, they are becoming fewer and farther between. The best way to stay informed of what’s changed in the Portal product is to check out the release notes. Just recently released, there are now three Learning Paths with a total of 10 modules. This is the start of the official Portal training we’ve been waiting for from Microsoft since the acquisition of Adxstudio! Business Applications MVPs Nick Doelman and Colin Vermander (check out more on them in the section below) host the podcast dedicated to the Dynamics 365 Portal product. Whether it is chatting with others in the partner community, or with those responsible for the product at Microsoft, listening to this podcast is the best way to keep up-to-date on all of the latest Dynamics 365 Portal news. While it hasn’t been kept up-to-date, there is still a lot of good content on this site, and most of it is still very relevant. It often comes up when looking for Portal content via your favourite search engine, and I even mentioned it in a recent blog post as it was the only place the documentation existed to answer someone’s question on the Microsoft Dynamics community forums. The following people do a lot of work with Dynamics 365 Portal, and their social media profiles are proof of it! If you’re interested in working with the Portal product, I’d strongly recommend following these people – they are the best of the best. Nick travels the world to share his love of the Portal product, and the entire Power Platform in general. You can find him at most conferences speaking about D365 Portal or delivering Portal training. His blog often focuses on Portal solutions, and he appears on the CRM MVP Podcast almost more than the host. As mentioned above, he is also the co-host of Refresh the Cache, the D365 Portal Podcast on the CRM Audio network. Having been a part of Adxstudio before and during the Microsoft acquisition, no one in the partner community has better insight into the Dynamics 365 Portal product than Colin. You can catch him on the conference circuit, or as the other co-host of Refresh the Cache on the CRM Audio podcast network. Elaiza produces a lot of great content – recently she’s been doing a lot of work with Microsoft Flow, but she’s also done a bunch with Dynamics 365 Portal. Between her blog and her YouTube channel, Megan puts out a lot of great Portal-related content. I highly recommend checking out her recent post on adding an inbox/messaging to your portal. 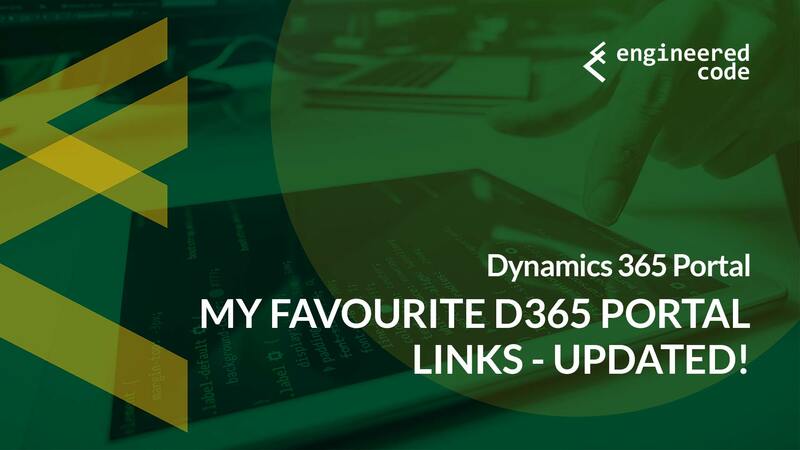 The post Dynamics 365 Portal: My Favourite Links [Updated] appeared first on Engineered Code.